As my time with Fairtrade comes to a close at the end of 2014, I wanted to thank everyone within the International Fairtrade Movement for their commitment to gold. Many followers of my blog will know I have campaigned for many years as a jeweller for a more equitable, Fair Trade, traceable and transparent supply chain. As the first jeweller in the world to call for fair trade jewellery, the time it has taken establish this is a salient lesson in patience, perseverance and sobriety. It takes a long time to embed change into a product like gold. But I leave in the knowledge and with the conviction that gold is in the best of hands with Fairtrade. Below are just 12 reasons why I believe this is the case. Despite these reasons not being the sexist you would want to associate with a romantic product like gold jewellery, they represent the depth and strength and institutional robustness needed to bring some level of uncorrupted accountability to such a rebellious and divisive product like gold. So many thanks to Fairtrade and my prayer is that they will grow from strength to strength not just in gold, but also in other ASM products. watch this space. 1. Governance – equitably owned. There is a reason why the Fairtrade system has become the world’s most successful and visible consumer certification system, and it is because the Governance structure is very strong. Whenever any organisation makes a consumer claim, the words mean very little unless there is a robust, strong, democratic and inclusive structure to underpin the public declarations. A truly international movement, Fairtrade is owned by Producer Networks (50%) and the National Fairtrade Organisations (50%) that label the certified goods to the market under the Fairtrade Mark. A strong system that is truly collegiate in design and shape. So whether you are a coffee farmer, gold miners or a Fairtrade activist, you are genuinely part of something much bigger than the sum of the individual parts. Don’t mistake slow for inactivity, as any glacier that carves it way through mountains will testify too. 2. It is 1/3rd party audited. Part of Fairtrade’s strength is the fact that the Fairtrade claim is an independently 1/3rd party audited system. This is critical for gold. We all know how corrupt the gold supply chain, so for jewellers to say Fairtrade Gold in the same breath, they need to have confidence that the label or stamp (unique for jewellery) has veracity. In simple terms the artisanal and small -scale source of the gold is certified according to the Fairtrade Standard for Gold. The chain of custody is then subjected to independent audits so the flow of the gold is handled in compliance with the trading standard. If you label or stamp your gold jewellery, you know that the supply chain traceable and transparent. The recent Rethinking_Consumption Roadmap report demonstrated that independent 1/3rd party certification is the consumer’s most trusted way of believing what they are told. Corporate claims and CSR featured very low by comparison. 3. Fairtrade’s historical strength & independence = objectivity & wisdom. Gold is a turbulent commodity and is systemically corrupted by illegal, non-transparent and secretive trading. You only need to turn to the Kaloti Refinery scandal earlier this year to realise that gold trading is an acutely dubious business. The International Fairtrade movement has over 20 years of consumer certification, working with small producers, building lasting supply, talking to consumers and managing the huge and varied challenges that come with the territory. of course no system is perfect and fairtrade have suffered from their fair share of criticism over the years, and concede they have made many mistakes. Yet the collective learning of this gives the movement a wisdom that cannot be brought for money. For jewellers wanting to work long-term in the field of responsible and transparent gold sourcing, they will need more than just technical knowledge, they will need an organisation that can apply that wisdom to gold jewellery. Additionally Fairtrade stand one step removed from the jewellery industries CSR initiatives that at best are looking after the their members, and at worst are green washing big brands. In jewellery trust is paramount and Fairtrade can be trusted with a grown up product like gold. Be careful of certification groups who over claim. Mining both large and small can boast some of the most extreme forms of child & forced labour of any industrial or production industry. It is simply impossible to make the claim that a mine is devoid of ‘child labour’. Child Labour is a very complex social problem rooted in poverty, cultural dynamics, criminal activity, such as trafficking and community realities. I recall my very first experience of child labour and exploitation in Jaipur, India and a visit I made to local Garnet mine, I would have rather have walk ed through Dante’s Inferno than lived as an indentured child mine worker. The Fairtrade Standard directly addresses the realities of mining and child labour, rather than the fantasy. Maplecroft a global risk consultancy publish an annual global index, which highlights the countries who are at most risk of child labour abuses. All the countries Fairtrade work in on gold; Peru, Colombia, Bolivia, Tanzania, Kenya and Uganda are listed as ‘extreme’. Therefore Fairtrade insists on robust child labour remediation policies, procedures, on the ground community based monitoring and a direct relationship with a Child Rights based organisation all represent best practice in this sector. At the time of writing they are preparing if a child is found working in and around a mine, the small-scale mining organisation is empowered to act to remediate the situation directly. We all know it is simply impossible to monitor 365 days 24-7 a community based mining operations, so Fairtrade’s approach is unique and effective. it does not run away from the challenge, it is after all why Fairtrade do exactly what they do. To bring change. In the last few years the legislative landscape around gold mining and trading has changed dramatically. Catalysed by the Dodd Frank Act and regulated by the USA Security and Exchange Commission, this act enforces transparency in the procurement of the 4 T’s (Tin, Tantalum, Tungsten & Gold). As a company importing any product with these metals into the USA you must be able to demonstrate that the minerals have been sourced are from a conflict-free operation. This simple law changed has birthed a number of international initiatives whose scope and remit now falls far wider than just a ‘destination USA market’, and directly affects the jewellery trade. The OECD Due Diligence’s on sourcing from conflict affected areas, The International Conference on the Great Lakes Region initiative against the illegal exploitation of natural resources. European Union strategy for trading with conflict affected regions, as well as a plethora of industry trade association guidance’s (World Gold Council, Responsible Jewellery Council, London Bullion Market Association). In short, considerable change at the top-level, that demands any certified Fairtrade gold producer group must comply with these top down rules in order to be legal. 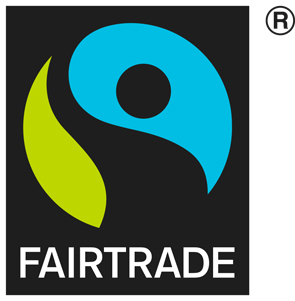 Therefore under the expert guidance of Estelle Levin, Fairtrade has aligned its core trading standard to embrace these changes. If you are a Fairtrade miner, operator or participant in the system at any level, you will automatically be compliant with these important developments. Fairtrade understand that big business can adapt easily to top-level changes, where as the small producers need more help to comply, and given the dearth of qualitative consultation with the majority artisanal miners, Fairtrade’s work in this area of producer empowerment takes on an even more significant value. No-one wants their gold to contribute to conflicts, Fairtrade certification is the best way of ensuring this reality. No one likes mercury and the moving story of Stella Adeke, a Ugandan female miner who is currently part of one of Fairtrade Africa’s gold pilot projects is a living illustration of why we need a mercury free standard. Stella’s son has serious health problems, associated with her direct exposure to mercury through her work as an artisanal miner. Mercury represents one of the biggest human health risk associated with artisanal mining, and also one of the environments largest and most lasting pollutants. By participating in purchasing Fairtrade gold, whether as a jeweller or as a consumer, you are making a tangible contribution to eradicating mercury from the artisanal sector. How? Well the Fairtrade standard is both pragmatic and aspirational. Pragmatic in as much as it recognises that we will not eradicate mercury usage from artisanal mining overnight. It is simply too inculturated into the processing of concentrate amongst small-scale miners. Therefore Fairtrade Africa and its networks, works closely to educate miners as to the damaging effects of mercury on public health and the environment. The Standard insists on the use of mercury retorts for the burning of amalgam and the banning of whole ore amalgamation and the open burning of mercury in domestic houses, by pregnant women, children and other at-risk groups. But beyond pragmatism, and in direct response to the Minamata Convention, (the UNEP initiative that has brought about a global mercury ban), Fairtrade is now working with mining experts, technology companies and wider community groups to introduce mercury-free technology that will remove the use of mercury from the processing altogether. This clean green gold is then eligible for Fairtrade Ecological certification that will gain the small-scale mining group a Fairtrade premium of 15%. Eco-gold for the jeweller, more money for the miners and no mercury release into the ecosystem. A win, win, win scenario for everyone concerned. 7. It has greater impact than recycled gold. Ok, let’s get real for a minute on the issue of recycling metals. It is now presented by the jewellery trade as an improvement in the jewellery chain of custody that demonstrates responsibility an d ethical performance. Well the truth is, recycling metals is at best a benign neutral practice that jewellers and refiners have been doing since the pre-history inception of the precious metals trade. Once upon a time (less than 10 years ago) jewellers ‘scrapped’ their waste metals back to refiners. Now we label it as recycled and call ourselves ethical. A very good example of green-washing an age-old practice. If we use the Price Waterhouse direct economic impact of gold infographic figures, we can see that of the $210 billion gross value add contribution that has been ascribed to gold for 2012, only $25 billion came from recycled. Jewellery accounts for $70 billion gross value add, just on its own. In simple terms the jewellery supply chain still draws in more fresh gold than it uses from recycled. Recycling does not prevent child labour issues, mercury usage, human rights abuses, destructive environmental practices, or eradicate the $1-2 USD poverty economy systemic in gold mining. It does not prevent conflict, or in any way contribute to the prevention of exploitative practices by illegal traders on poor marginalised mining communities. 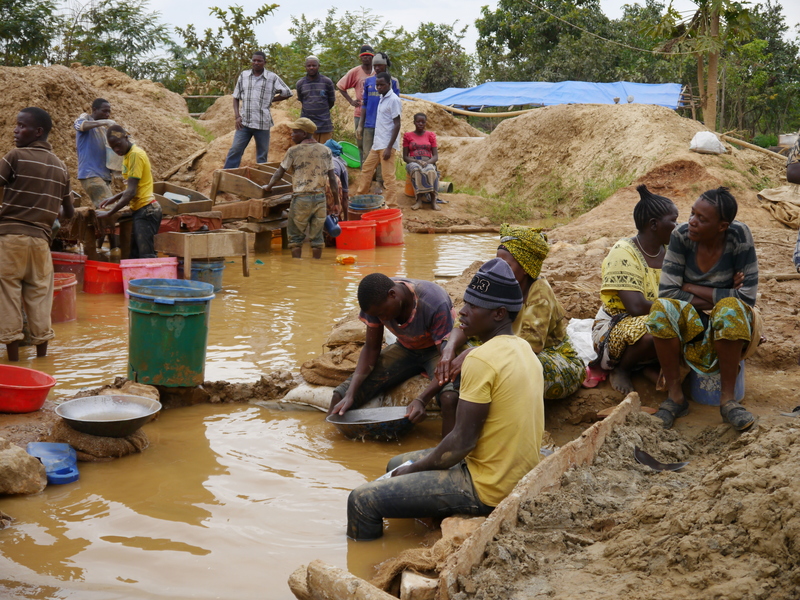 If as jewellers and consumers we are serious about using our purchasing power to transform the gold sector into a cleaner, greener and more transparent industry, we should insist upon Fairtrade Gold. This way we know our purchase is driving deliverable change on the ground. 8. Its building a peace legacy – Agriculture vs. ASM a false choice. There is a stereo-type that artisanal miners and farmers are often in conflict over the same land resources. There is no doubt that this does happen, yet in the vast majority of cases I have witnessed, a small-scale artisanal miner actually does both. It is called having ‘an diversified livelihood strategy. Of course the miner doesn’t call it this. They call it survival. Plant crops, harvest your crops and be an artisanal in between times. It’s another any of having your finger in more than one pie. In some regions, especially desert conditions, being a farmer is not an option, so the only livelihood is mining. However as we are witnessing in Africa, the Fairtrade movement is uniquely placed to reach out across these kind of divides as it represents and works with both small farmers and miners. Single issue groups and schemes simply do not have the on the ground reach to bring farmers, miners and other producers together in a way that builds peace and prosperity for everyone. a) Gold Sourcing Partnership (GSP). This allows brands to mass-balance Fairtrade gold into their own ‘chain of custody’ thereby making a significant contribution to both the mining communities from where it was sourced, as well as to Fairtrade and their broader efforts to expand the benefits of fairtrade certification to other ASM communities. b) Classical Licensee’s are companies and brands who are typically SME’s and who want to secure fully traceable material to add value to their jewellery offering whilst driving maximum value back to mining communities through labeling, stamping and telling the miner story. This is Fairtrade’s tried and tested model and represents the one that the vast majority of jewellers want to be a part of. With the rights to full consumer messaging and stamping the metal, this adds genuine ethical value to an already valuable product. c) The Goldsmiths Registration scheme was launched at the end of April 2014. 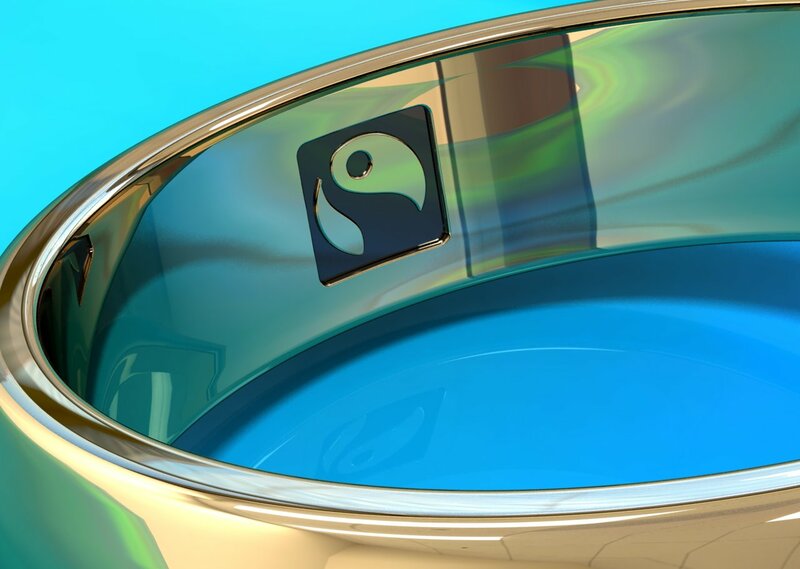 Fairtrade recognised that it had a responsibility to the small jeweller, designer maker, goldsmith, to enfranchise them into making their contribution. A small jeweller or goldsmith is defined as someone who purchases less than 500g of fine gold or 2kgs of fine silver per year. This in turn when added together makes a huge difference. Through the simple on-line registration, at www.fairgold.org/ the goldsmith can become a recognised part of the Fairtrade Gold movement, purchase from authorised suppliers who sell semi-finished products like sheet, wire, grain and in doing so make their contribution to the transformation of artisanal miners lives. When you consider that the jewellery trade is dominated by small players, jewellers or independent retailers, Fairtrade’s goldsmith scheme is the easiest way the smaller people can have a big impact. In conclusion the Fairtrade business models engage everyone in the jewellery retail business in a way that is appropriate to them. In turn this drives greater sales to certified miners which is after all why we all do it. Fairtrade is business, not charity. 10. It is focused on real people. In my opinion there seems to be an emerging assumption that luxury jewellery brands are the key to unlocking the potential of responsible sourcing from small-scale and artisanal miners. This is a myth. The jewellery trade and the certified miners need to deal in the material facts. Luxury jewellery and fashion brands may well capture the aspirational ego and vanity in us all, but in real terms account for very little of the consumer demand for gold jewellery, less than 5% of global consumer sales. Fairtrade is focused on real people, real consumers, the real jewellers, the real miners and their communities. It is this clear mission to enfranchise all, rather than blow green smoke up the arses of luxury brands, that will ensure the equitable distribution and long-term success of Fairtrade gold. Fairtrade is working to establish the offering as a systemic part of the national jewellery offering. In the UK this is taking root as I write, with Switzerland, Germany, USA, Australia, Netherlands all looking to integrate Fairtrade gold into the very heart and soul of what the jewellery trade can deliver. This of course includes luxury brands, but does not pander to their need to be seen as special. So for the real consumer and the long-term sustainability of the category, this is clearly the way forward. 11. The best ethical assurance stamp in the world for jewellery. The Fairtrade stamp is the only ethical assurance stamp in the world that covers gold jewellery. Only authorised license holder are allowed to strike the mark and wherever a consumer sees this mark struck in their jewellery means that the gold or certified precious metal can be traced back to the certified source. So the message for consumers is simple. Look for the Fairtrade stamp in the gold jewellery you buy. If it’s stamped it means it is a traceable product from mine to retail. In jewellery this is worth more than gold, it represents the very integrity of the aspirational claim we all make as jewellers. The Fairtrade minimum price, premium and license fee combined means that Fairtrade gold added costs should be a mere $3.80 per gram on the retail price. In simple terms this makes Fairtrade gold a very affordable product for jewellers to switch to. Now if jewellery companies wish to be lazy with their accounting, then it may be more if they simply add the premium to the gold price and then add their profit margins on top. But this practice should be seen as unethical, even though it is legal. So my parting words to jewellers would be, let’s not profiteer from the premium, rather let’s offer the affordable Fairtrade gold to the consumer. After all it is a matter of consumer choice. So in conclusion, although this chapter with Fairtrade now closes for me personally, it does not mean new ones will not be written. With many more exciting adventures lined up for 2015 and beyond I am hopeful that the jewellery trade will continue to be a vehicle for genuine social and ecological transformation. Onwards and upwards. Next Post The Road beyond Tucson. I do accept it, fair trade system is the most effective way to the people when they wish to buy ornaments as well it will build good relation between customer and seller. its affordable price ranging and especially Eco-fair trade system is really amazing. Most of the people believe and buy jewellery on trust. That trust given by fair trade. Thanks for the content, it is really nice to know the information. It bring clear clarity on what kind of jewellery is the best to buy.